Mother Nature is unlikely to ever cease the vicious conditions that come hand-in-hand with the winter season. As the roads remain brutal, settling for the same old equipment year after year is not an option. BOSS has remained eager to bring you the latest technologies and state-of-the-art gear that will get the job done quickly and efficiently. Below is a detailed look at how BOSS has continued to innovate snowplow headlights over the years to bring you the SmartLight1, SmartLight2, and now the SmartLight3 (SL3) L.E.D. Headlights with Ice Shield Technology™. The first set of BOSS headlights that accompanied plows was the SmartLight1. The SmartLight1 features a sealed beam halogen light to get you through winter conditions. 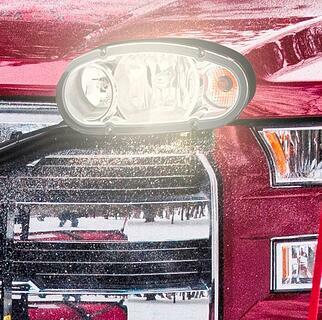 The heat released from these halogen headlights prevents snow and ice buildup on the lenses. Once made of aluminum, the SL1 then updated to plastic material in order to avoid corrosion. The SL1 holds a low profile, held in place by a single stud attachment. The first set of BOSS headlights is similar to a set of basic headlights that you would find on standard vehicles. The SmartLight2 comes equipped with the same halogen light system that keeps lenses clear and ice-free on the SL1, thought it now has halogen infrared light. This new light system provides a consistent light pattern with no dark pockets. The span of light on the SmartLight2 headlights reaches over 22 yards wide, making edges of the road completely visible for snowplow operators. It also reveals objects over 160 yards in the distance, helping drivers to avoid any potential unforeseen dangers. The dual-stud mounting and vise-like grip on the SmartLight2 reduces any light vibration that may have occurred on the SmartLight1 headlights. It also locks the plow into place, eliminating the need for frequent adjustments. 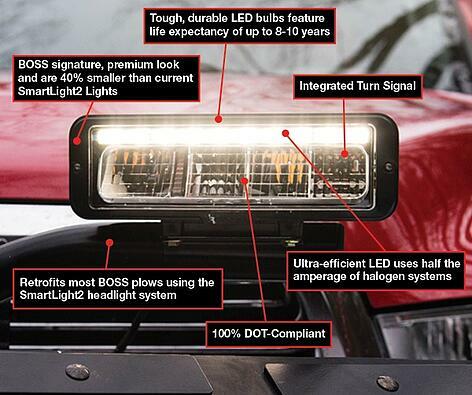 Lastly, the SmartLight2 features a clean appearance that better matches newer modeled truck equipment. The latest and greatest light system from BOSS has arrived, and it now comes standard with all snowplows.The SL3 headlights features 100% L.E.D. light that has up to two times the light output of traditional halogen packages.This allows for a fuller light pattern and better view when battling the winter conditions.The SL3 emits the coolest color temperature, releasing white light that is less straining on your eyes and more clear than the yellow glow of halogen lights. The L.E.D. lights on the SL3 with Ice Shield Technology™. A thermally conducted grid heats the lens and melts snow and ice faster than the heat from halogen lights. Additionally, the SL3 is 40% smaller than the SmartLight2 headlights, providing better vision on the road and less light movement on the job. Though its light projects brighter and reaches farther, the SL3 uses half the amperage of halogen systems. This gives the light a longer life span of 8 to 10 years. The SL3 is DOT compliant and uses the same light mounting as SmartLight2, making it easy to upgrade and enjoy the benefits of this new technology. Follow the link below to view the SmartLight3 in action!